The overall cannabis testing market expected to reach USD 1,416.3 million by 2021 from USD 822.0 million in 2016, at a CAGR of 11.5% of during the forecast period (2016-2021). Owing to various social and political factors, cannabis has been banned in most countries since the early 1900s. At present, many countries are increasingly recognizing the benefits of cannabis for medicinal purposes and are hence approving its use. As of January 2015, 23 states in the U.S. along with the District of Columbia as well as Canada and various European countries have legalized the use of cannabis for medical applications. Thus, growing approval for the use of medical cannabis will create a demand for analytical testing for safety for human consumption. The base year considered for the study is 2015, and the forecast has been provided for the period between 2016 and 2021. Medical cannabis is proven to be effective in various medical applications, such as reducing nausea caused due to chemotherapy, stimulating appetite in AIDS patients, controlling muscular spasms in multiple sclerosis patients, and reducing intraocular pressure in patients with glaucoma. Owing to these potential health benefits, governments in various countries are legalizing the use of medical cannabis. Countries including Australia (2016), Canada (2015), North Korea, Spain, Portugal (2001), the U.K. (2006), Germany (awaiting approval by the end of 2017), Italy, the Netherlands, Israel, and Brazil have legalized the use of medical cannabis in recent years. Moreover, in the U.S., 25 states have legalized medical cannabis; four states Colorado, Washington, Oregon, and Alaska—have legalized cannabis for both medical and recreational use. As medical cannabis is being legalized in a number of countries/states across the globe, the demand for the analytical testing of cannabis for ensuring its safety before human consumption has increased in recent years. According to industry experts, there are approximately 250 cannabis testing labs in the U.S. and their number is expected to grow by 17.5% in the coming years primarily due to growing legalization. Such trends are indicative of the expected growth in demand for analytical instrumentation, software, and services for cannabis testing in the coming years. *Note: Numbers in brackets indicate the legalization year for medical cannabis. The study estimates the cannabis testing market size for 2016 and projects its demand till 2021. In the primary research process, various sources from both demand-side and supply-side were interviewed to obtain qualitative and quantitative information for the report. Primary sources from the demand-side include various industry CEOs, Vice Presidents, Marketing Directors, technology and innovation directors, and related key executives from the various players in the healthcare chatbots market. For the market estimation process, both top-down and bottom-up approaches were used to estimate and validate the market size of the healthcare chatbots market as well as to estimate the market size of various other dependent submarkets. All possible parameters that affect the market covered in this research study have been accounted for, viewed in extensive detail, verified through primary research, and analyzed to get the final quantitative and qualitative data. This data was consolidated and added to detailed inputs and analysis from MarketsandMarkets and presented in this report. 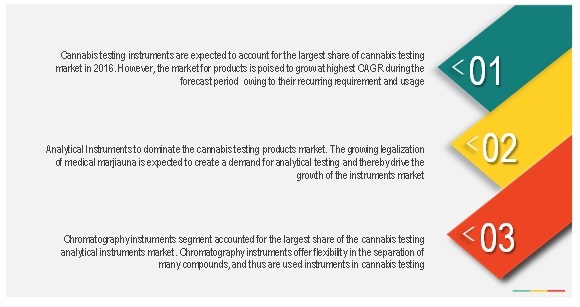 Prominent players in the cannabis testing products and software market include Agilent Technologies, Inc. (U.S.), Shimadzu Corporation (Japan), PerkinElmer, Inc. (U.S.), Millipore Sigma (U.S.), AB SCIEX LLC (U.S.), Waters Corporation (U.S.), Restek Corporation (U.S.), Accelerated Technology Laboratories, Inc.(U.S.), and LabLynx, Inc.(U.S.). While, Steep Hill Labs, Inc. (U.S.), SC Laboratories Inc. (U.S.), CannaSafe Analytics (U.S.), PharmLabs, LLC (U.S.), and Digipath Labs, Inc. (U.S.) are some of the prominent players in the cannabis testing services market. In September 2016, AB SCIEX LLC (U.S.) entered into a collaboration agreement with CW Analytical (CWAL) (U.S.), a leading cannabis testing laboratory to develop cannabis quality and potency testing standards. As per this agreement, Sciex will offer CWAL with LC-MS/MS expertise and instrumentation including the SCIEX Triple Quad 3500 System, with MultiQuant Software which will help in the simultaneous processing of multiple analytes. In August 2016, Agilent Technologies, Inc. acquired iLab Solution LLC, (U.S.), a prominent player in providing cloud-based laboratory management software. This acquisition helped Agilent to strengthen its software and informatics product portfolio. This report categorizes the cannabis testing market into following segments and subsegments. The cannabis testing products market is broadly categorized into two segments, namely, analytical instruments and consumables. Cannabis testing instruments are expected to account for the largest share of the cannabis testing market in 2016. However, the market for consumables is expected to grow at the highest CAGR during the forecast period owing to their recurring requirement and repetitive usage. 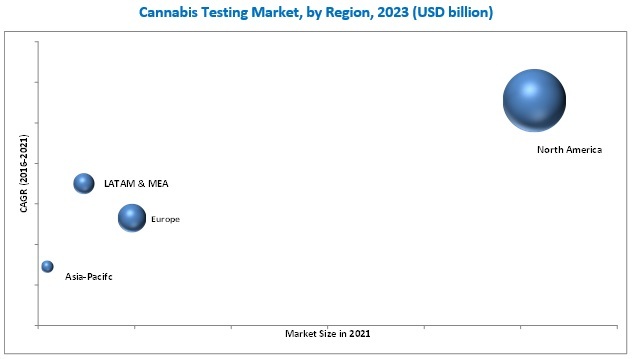 The global cannabis testing market is expected to reach USD 1,416.3 million by 2021 from USD 822.0 million in 2016, at a CAGR of 11.5% of during the forecast period (2016-2021). 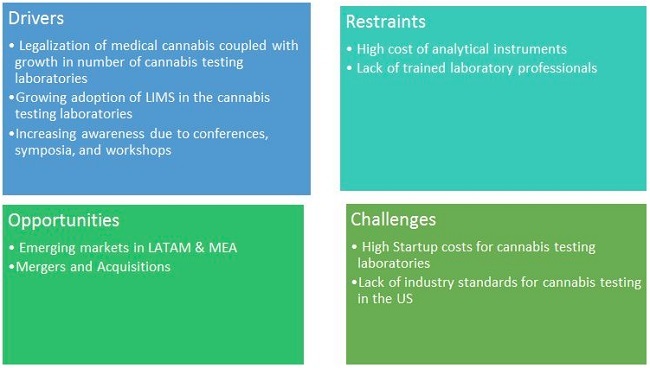 Growth in the cannabis testing market is primarily driven by factors such as legalization of medical cannabis; growing number of cannabis testing laboratories; growing adoption of LIMS in cannabis testing labs; rising awareness of the medical use of cannabis through conferences, symposia, and workshops; and increasing availability of analytical testing instruments and software. The appropriate use of advanced analytical instrumentation requires relevant experience and knowledge of chromatography, spectroscopy, and PCR. The lack of awareness regarding the right choice of technique (especially in emerging economies) incurs several other indirect expenses and increases the workload and time pressure on researchers. This is limiting the adoption of these technologically advanced products among laboratories. According to the U.S. Bureau of Labor Statistics, the U.S. is facing a shortage of STEM (science, technology, engineering, and mathematics) professionals and the demand for skilled professionals in the fields of medical research, pharmaceuticals, and science start-ups is expected to increase by 40% by 2018. Other major markets across Europe and APAC are facing similar issues, and as a result, the lack of trained laboratory professionals is expected to restrain the overall growth of the cannabis testing instruments and consumables market. Growing legalization of medical marijuana (especially in the US), and funding initiatives for cannabis testing laboratories, are driving the growth of cannabis testing services market. Potency testing involves isolating cannabinoids and evaluating their strength and the effect they will have on medical marijuana users. There are about 113 different cannabinoids. The primary cannabinoids of interest are THC (tetrahydrocannabinol), THCa (tetrahydrocannabinolic acid), cannabinol (CBN), CBD (cannabidiol), and CBDA (cannabidiolic acid). Liquid and gas chromatography are some of the recommended methods for potency testing. In addition, portable cannabis analyzers are used for on-field potency tests that deliver on-the-spot results for THC, THCa, CBD, and CBDA in dried cannabis and processed oils. Terpenes are volatile unsaturated hydrocarbons that give an aroma to cannabis. They act as essential medicinal hydrocarbon building blocks, influencing the overall homeopathic effect. Residual solvents are excess chemicals from the process used to extract cannabinoids and terpenes from cannabis plants. These solvents are evaporated to prepare oils, waxes, and edibles. Sometimes, the evaporation process does not eliminate all solvents. As these solvents can cause harmful effects if consumed, it is very crucial to remove them. Cannabis plants are prone to contamination from microorganisms such as mold, mildew, bacteria, and yeast. The presence of pathogenic bacteria such as Escherichia coli and Salmonella as well as fungal toxins such as mycotoxins and aflatoxins can cause severe illness, especially in children or immunocompromised patients using medical marijuana. qPCR and LCMS are some of the recommended analytical techniques used in microbial analysis. Pesticides used to protect cannabis plants can be carcinogenic and mutagenic, causing serious harm to cannabis consumers, especially to immunocompromised medical cannabis users. Thus, ensuring that cannabis plants and products are pesticide-free before consumption is of prime importance. Heavy metals include arsenic, mercury, lead, cadmium, and chromium. These are toxic metals that can enter the plant through natural means as well as contaminated soil and fertilizers. These metals can be detected at trace amounts (ppt) by ICP-MS or ICP-OES. Laboratory testing is conducted to ensure that cannabis products are free from these toxic metals. Lack of trained laboratory professionals is one of the major limitation owing to the lack of relevant experience and lack of awareness regarding the right choice of technique used for cannabis testing faced by various cannabis testing laboratories and stake holders, when will this scenario ease out? 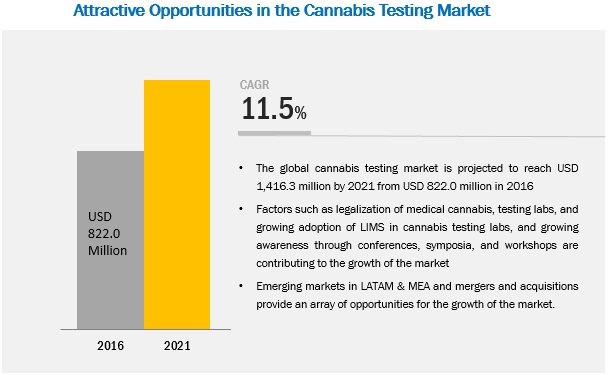 Emerging economics markets in LATAM (Latin America) and MEA (Middle East Africa) are expected to witness high growth in cannabis testing market in coming years owing to the strong government support for legalization of medical cannabis in these countries as compared other countries, will market platers continue to explore new avenues for cannabis testing market in these emerging region? Majority of the market players have adopted product & service launches and product upgrades and enhancements as their key growth strategies. What impact this will create on cannabis testing market in the mid to long term? The cannabis testing market is segmented into products and software. The product segment is expected to register at the highest CAGR during the forecast period. The high growth of this segment is attributed to the growing requirements for potency labeling and pesticide screening which drive the demand of analytical instruments, introduction of technologically advanced products and recurring demand for the consumables. The cannabis testing market in North America is expected to grow at the highest CAGR during the forecast period. Factors such as growing legalization of cannabis for medical use; rapid growth in the number of cannabis testing laboratories; presence of prominent players in this region; growing awareness regarding medical cannabis through various seminars, conferences, and symposia; and rising funding for the cannabis industry are influencing the growth of the cannabis testing market in this region. What are the new avenues for the market players in emerging economies? 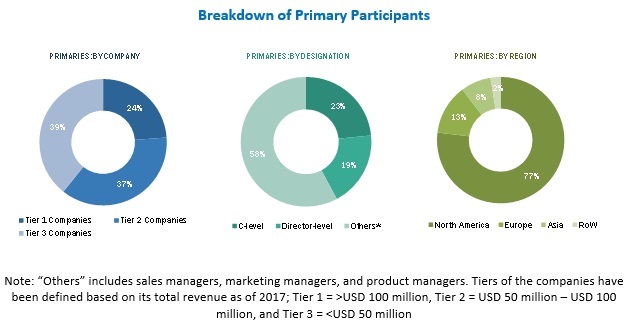 Key players operating in products and services market include Shimadzu Corporation (Japan), Agilent Technologies (U.S.), PerkinElmer, Inc. (U.S.), Millipore Sigma (U.S.), AB Sciex LLC (a Danaher Company) (U.S.), Restek Corporation (U.S.), Thermo Fisher Scientific, Inc. (U.S.), Waters Corporation (U.S.), Fritsch Milling (U.S.), Accelerated Technology Laboratories (U.S.), CannaSys, Inc. (U.S.), PharmLabs, LLC (U.S.), Guardian Data Systems, Inc. (U.S.), and Lab Lynx, Inc. (U.S.). On the other hand, Steep Hill Halent Laboratories, (U.S.), DigiPath, Inc. (U.S.), SC Laboratories (U.S.), CannaSafe Analytics (U.S.), and CW Analytical Laboratories (U.S.) are some of leading players operating in the cannabis testing services market. 5.2.4.2 Lack of Industry Standards for Cannabis Testing in the U.S.
12.9 Accelerated Technology Laboratories, Inc.
12.10 Steep Hill Halent Laboratories, Inc.
12.12 SC (Science of Cannabis) Laboratories, Inc.
Table 152 Market Ranking (2016) By Key Player: Software Market (Cannabis LIMS) in the U.S.